Vector pink balloons on white lighting glitters. Birthday background with balloons. Beautiful girl in a pink dress with balloons. Greeting card with hedgehog and balloons template. Graphic illustration of boho girl with balloons. 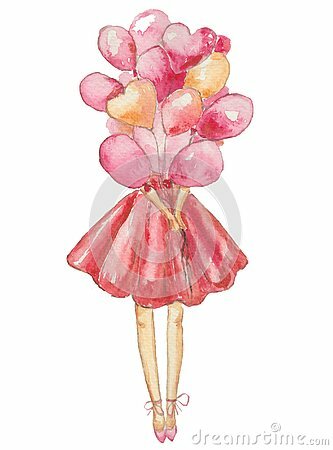 Watercolor set for holiday greeting cards with cute young girl, balloons and heart. Horizontal Flat Banner Goddess Everyday Daily.